Olive trees grow all over the San Fernando Valley. Native to the Mediterranean, missionaries planted them here in the 1800s. By now, they’ve virtually gone native, and some have gone wild. I’ve harvested and cured black Mission Olives growing in a dusty field, without the aid of irrigated watering. 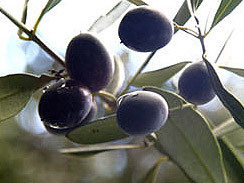 Olives generally taste awful if eaten directly from the tree. They naturally contain bitter phenolic, oleuropein and glycoside compounds. one of several curing processes can be used to remove the bitter tasting compounds. Curing can employ lye, salt, brine, fresh water, or a combination. 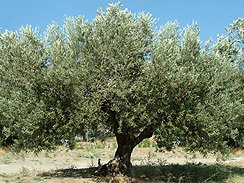 INITIAL 10-DAY WATER CURE: After gathering olives from trees, sort and discard diseased or insect infested fruit. Clean in cool water. Using a very sharp knife, make a full-length slit to the pit on both sides of each olive. Place olives in very large glass jar. Submerge olives in cool water, leaving enough air space a top for empty plastic sandwich ziplock baggy. Fill ziplock baggy with water, sealing baggy. Fill any remaining air gaps in jar with cool water. The idea is to use the baggy to force all olives below the water line. Change water every other day, curing for a total of 10 days. After tenth day, drain all water. SECONDARY 6-WEEK BRINE CURE: Create brine by combining 2 parts water and 2 parts apple vinegar with 1 part salt in saucepan, heat on medium flame to dissolve salt. Allow liquid to to cool to room temperature. Remove skin from garlic cloves, cutting each clove into 4-5 pieces. 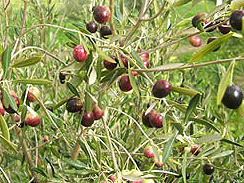 Place drained olives, garlic, rosemary and sticky monkey flower leaves in large glass jar. Add brine and balsamic vinegar, leaving 1″ air gap at top. Fill air gap with olive oil, add lemon slices. Loosely put lid on jar. Allow to cure. Try a taste each week. When you like the flavor, move to refrigerator and enjoy. The longer they cure, the less bitter they’ll taste. Some olives require 6-8 weeks for brine curing. Mine tasted incredible after only 1 week. Really tasty.